Taliaferro holds 8 out CCU’s top 20 single-game performances, included rushing for 205 yards on 32 attempts against Elon. He was a 2013 Walter Payton Award Finalist, a College Sporting News Fabulous 50 nominee, a College Sports Journal Sweet 63 nominee, 1st-team All-Big South, 2nd-team All-American as voted on by the Associated Press and The Sports Network, SAAC Male Athlete of the Year, and Big South Male Athlete of the Year. In addition, he won the 2013 Big South Offensive Player of the Year award. Taliaferro (6’0″, 225 lbs) was drafted in the 4th round of the 2014 NFL Draft by the Baltimore Ravens. His career was off to a bright start; in a week 3 victory over the Browns, Taliaferro rushed for 91 yards and touchdown. He then followed it up with a 2-touchdown game against the Cincinnati Bengals. Taliaferro finished his rookie season with 68 carries for 282 yards (4.3 ypc) and 4 rushing touchdowns. Unfortunately, a nagging foot injury has limited his playing time over the past few seasons, and Taliaferro was waived by the Ravens during final roster cut downs in 2017. 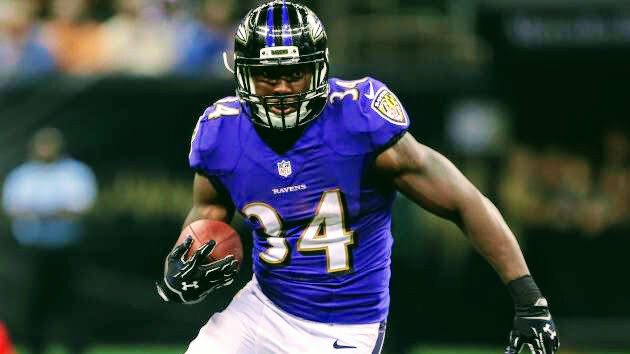 In 2018, the 26-year old running back/fullback will join The Spring League to prove to scouts his foot is fully healed and he is ready to contribute again on Sunday’s.